Sport and Citizenship has seen through the Erasmus+ co-funded PASS Project. Over 3 years the Think Tank has lead the project with the help of six other partners. The final conference presented the project results and recommendations. 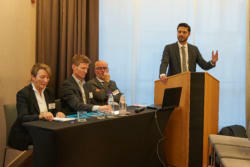 In January 2015, Sport and Citizenship set out with the bold intention to actively fight the European physical inactivity pandemic, and did so thanks to the co-funding o the Erasmus + Sport programme, and with the help of six other major European players in the sport field: EUPEA, FESI, ISCA, ICSSPE, Spolint Institute and TAFISA. The target was set for the PASS project– to propose political ad strategic actions for the promotion of physical activity in Europe. To do so the course of action was three-fold: first to undertake detailed research as a way of measuring the factual status quo of Europe’s inactivity crisis and the resulting costs; second, to raise awareness amongst decision-makers about the crisis and the necessity for the crisis to be treated as a transversal political priority; and finally, to engage change-makers and sport prescribers to demonstrate their objectives align with those of HEPA (health-enhancing physical activity). 36 months later and bearing these founding elements, the European PASS project has reached its final steps, including the time to share the project’s main findings and recommendations. Thus, on December 5 in the Sofitel Hotel Brussels the final conference for PASS was held, following the European HEPA Cluster meeting which was made possible by the EACEA- and is further proof of their interest in the project’s findings. “ How to bridge the gap in physical activity promotion?” gathered quite the crowd, and the diversity of panellists perfectly illustrates the benefits of cross-sector collaboration, one of PASS’s core recommendations, as each speaker represented a project partner all of whom are involved in sport and physical activity from a diverse range of angles. Sport and Citizenship’s president Laurent Thieule gave a welcome speech to the participants before leaving the floor to Dr. Richard Bailey of ICSSPE who outlined the research undertaken for the project. Three main figures stand out: 210 million Europeans are inactive, resulting in a yearly cost of 80 billion euros across the EU28 (solely accounting for the four major non-communicable diseases that are coronary heart disease, type 11 diabetes, colorectal and breast cancers, together correspond to 6,2% of social security spending), and perhaps the most alarming figure of all, is that 66% of local decision-makers are completely unaware of this status co- both at large and locally. Project manager and conference moderator Maxime Leblanc yet again recalled the most effective policies promoting and facilitating access to physical activity and sport rely on two crucial aspects: cross-sector collaboration, and multi-level governance. Jacob Schouenborg, ISCA’s Secretary General, underlined the growing importance of grassroots sports and community-based organisations in regards to the promotion and advocacy of HEPA, as they are and should continue to offer gateways to healthier lifestyles to all via physical activity rather than solely under the branding of sport. The latter can bear unappealing connotations such as elitism, competition, or training drills that dissuade people from participating in any form of movement. In this sense, grassroots organisations promoting leisure physical activity possess great potential to address the inactivity pandemic in a cost-effective manner, offering citizens the possibility to play their part, and all in all epitomising an alternative approach to top-down policies. Thus it was made clear that civil society organisations should further endorse an active role in the multi-level governance approach to counter sedentarism. Subsequently, Wolfgang Baumann TAFISA’s General Secretary displayed the role cities need to endorse to reverse the tide of inactivity, notably by rethinking urban structures in a way that offers easy access to daily movement (bike paths, lighting for running, leisure areas, …). In doing such and taking into account relevant research withholding recommendations for implementing, evaluating and monitoring physical activity levels. Given 66% of policy-makers are unaware of the present inactivity crisis in addition to the estimation that 80% of the European population will be living in urban areas by 2050, it becomes clear cities possess a game-changing role to adopt and an immense impact potential. Rose-Marie Repond of EUPEA presented the value of yet another sector that is not to be overlooked- schools. As the only sphere virtually attended by the entire population, schools withhold an essential role in providing quality physical education. However, physical activity cannot be constrained to Physical Education classes alone. Movement must be re-introduced into children’s daily routines, and number of inexpensive solutions exist for before, during and after-classes thus making “Active Schools”. To do so, schools must re-consider their position in regards to movement and physical education, stop treating it as a lesser-subject in view of children’s well-being, all of which require equipping PE teachers with greater physical literacy and granting them more opportunities. Finally and perhaps the most surprising stance of all, was that of the sport industry. The General Secretary of FESI, Jerome Pero, clarified the sport industry’s new position in regards to sport, that has followed an evolution from the pure sales of sporting goods to that of being involved and integrated into communities. The sport industry wants to be part of the physical activity promotion notably by promoting a sport experience to its costumers. FESI also advocates sport as a long-term investment, not a cost- a perspective requiring more widespread consent. The end of a chapter only means the start of a new one. The PASS project’s immediate legacy was ensured last July (2017) as the EACEA selected Sport and Citizenship’s project application amongst 360 others, to receive Erasmus + Sport funding. PACTE (Promoting Active Cities Throughout Europe) is a direct follow-up to PASS’ main findings, as it aims to focus on physical activity policies of European municipalities. Starting January 2018, PACTE will undertake a large-scale survey collection to then further create an Active Cities matrix for change, to then launch a communication campaign to support the development and delivery of municipality physical activity policies.